Cool-Aide mixes with water and antifreeze. Cool-Aide is for race use and does not offer freeze protection. Approved for race use on paved surfaces. MAXIMA PERFORMANCE BREAK-IN OIL is specifically designed for breaking in engines with flat tappet camshafts, roller elements or where elevated levels of anti-wear additives are needed. High Zinc/Phosphorous formula is blended with highly refined, pure petroleum base stocks to provide optimum ring seal. 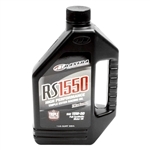 MAXIMA RS 4-cycle engine oil is a full synthetic, triple ester based race-grade oil. Industry leading additive system offers the ultimate in engine performance and protection. Maxima Performance 4-cycle engine oil is an exclusive blend of highly refined petroleum base stocks and technologically advanced additives. MAXIMA SEMI-SYN 4-cycle engine oil is a complex blend of synthetic esters and highly refined petroleum base stocks offering protection beyond conventional oils. MAXIMA SEMI-SYN is compatible with petroleum and synthetic engine oils. SEMI-SYN is a fully formulated race oil and does not require the addition of additives or boosters. MAXIMA SYNTHETIC RACING ATF is specifically formulated to perform in automatic racing transmissions under high-torque, high-horsepower conditions. Racing Shock Fluid “Medium” can be used when more damping is required. Use “Heavy” for Ohlins® and FOX® shocks. MAXIMA ASSEMBLY LUBE is a specialty, film forming lubricant designed to protect moving components and wear surfaces during assembly and initial break-in. PROFESSIONAL FORMULA Speed Wax is a specialized detailer. An all-in-one detailer that conditions, shines and protects painted surfaces, chrome, anodizing, windscreens and plastic. Professional formula integrates strong industrial cleaners with a powerful spray. Overspray will not harm o-rings or most seal materials. Displaces moisture. Maxima Multi Purpose Penetrant Lube is a superior, all purpose penetrating lube that displaces water and provides excellent rust and corrosion protection. Maxima Chain Wax is a superior power spray lubricant designed for all chain care needs. It’s special ParaFilm™ formula creates a waxy film similar to Cosmoline, offering long term protection especially in water and high humidity environments. Makes the clean up process easier – excellent for use on M/C and ATV fenders to prevent mud and dirt from adhering to plastic. SC1 is water resistant and leaves a long lasting luster and shine. For all air and water-cooled 2-cycle and 4-cycle transmissions with wet clutch systems. Also, designed and tested for wet brake systems. MAXIMA SYNTHETIC POWER STEERING FLUID (SYN PSF) is a high-performance oil engineered to perform under the severe stresses found in modern day racing power steering systems.